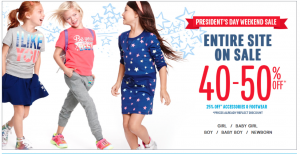 President’s Day sales: The Children’s Place, Vera Bradley, Justice & more! Happy President’s Day! If you’re ready to do a little shopping check out these awesome online deals and coupon codes! The Children’s Place President’s Day Sale: Save up to 50% off everything online plus free shipping on EVERY order!! Enter the code sprdm20fy to save 20% at check-out! Gymboree President’s Day Sale: Save up to 80% off original prices plus free shipping on every order with the coupon code WASHINGTON. Earn $25 in Gymbucks for every $50 you spend. Justice: 40% off your entire purchase plus a bonus 20% off with the code 751. Earn $30 in J-Bucks for every $50 you spend! Get free shipping when you spend $99+ or pay a flat rate of $5.99 on all other purchases. Kohl’s President’s Day Sale: Kohl’s card holders can save up to 30% off their entire purchases! 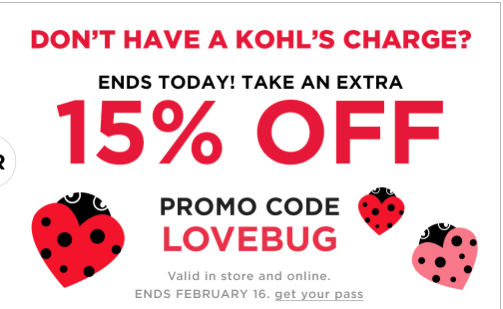 Everyone else saves 15% with the code LOVEBUG plus everyone gets $10 in Kohl’s cash for every $50 you spend! Vera Bradley President’s Day sale: Save 30-50% on sale styles PLUS get free shipping on any online order! The Children’s Place MONSTER SALE plus free shipping! 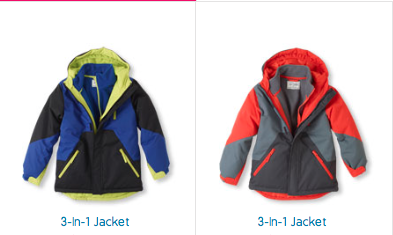 The Children’s Place is having an AMAZING sale online today! Save an additional 40% on all clearance items (the discounts will be applied at check-out) PLUS there’s an additional 20% off your entire purchase code AND you can get free shipping on any order! Use code 20PROMO3 for 20% off your entire purchase! Graphic long sleeve and short sleeve tees are $2.87 after discounts, PJs are $4.03, and you can even get a 3-in-1 jacket for $19! Buy ahead for next year! They also had cargo shorts for $3.83! There are TONS of other deals, so make sure you browse the clearance section! Make sure you sign up for My Place Rewards – earn points toward FREE GIFT CARDS! With my purchase today, I had enough points to get a $5 gift card! The Children’s Place 50% off FLASH SALE! *This post contains affiliate links. Please refer to my disclosure policy for more information! Starting NOW, The Children’s Place 50% Off Flash sale is LIVE ONLINE! You can save 50% off everything on the site and get free shipping, too (there are no minimum purchase requirements for the free shipping). This is comparable to their Black Friday sale, but NO COUPON CODE IS needed!! Discounted prices are listed on the site. The fine print details on this sale indicate that it cannot be combined with other offers, so even if you have coupons for previous deals, you probably can’t use them. You can still score some AWESOME deals, though!! Jeans are $9.75, tees are $5.25, and PJs are just $7.47 with this sale! There are TONS of other great deals on the site and even holiday PJs and apparel are included! The Children’s Place $1 Weekend Sale!! The Children’s Place $1 Weekend Sale starts when stores open TODAY! Score gloves, hats, scarves, and slippers for just $1! 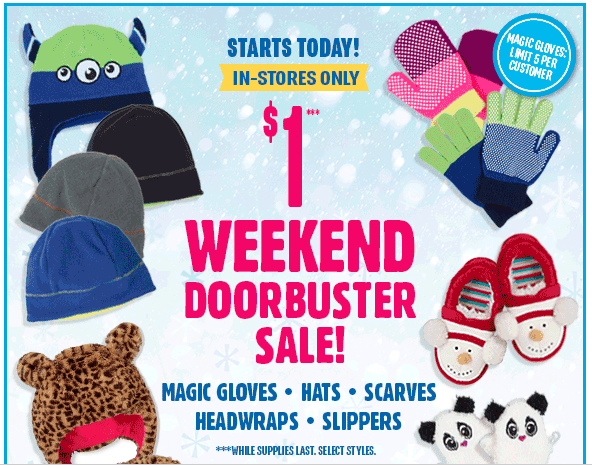 Check out Doorbuster Stocking Stuffers like socks, jewelry, and hair accessories for $1, too! PLUS, they’ll have Doorbuster Sleepwear for $5.99! Save an additional 25% in stores with the code Y10303. This beats Black Friday pricing and I thought I score some great deals then! If you shop in the clearance section, you will see an additional 40% discount on all items in your cart at check-out! If you buy a $40 gift card, you’ll get a $10 coupon to use on a future purchase! Let me know what deals YOU score! The Children’s Place Black Friday Sale is LIVE NOW! The Children’s Place Black Friday Sale is LIVE ONLINE NOW! You can save 50% off everything on the site and get free shipping, too (there are no minimum purchase requirements for the free shipping). I was able to score 2 pairs of boys jeans, a long sleeved boys tee, 2 pairs of PJs, and a 3 pack of underwear for $32 shipped! Use the code 4PB10FY20 to score 25% off your total purchase price, too! Jeans are $7.80, tees are $4.20, and PJs are just $5.98 with this sale! There are TONS of other great deals on the site and even holiday PJs and apparel are included!